Bulleys commercial property experts offer a wide range of commercial property in Wednesbury. Finding commercial property for sale or to let throughout Wednesbury and West Midlands can often be a time consuming process, so we provide our expertise to help you make the right choice. 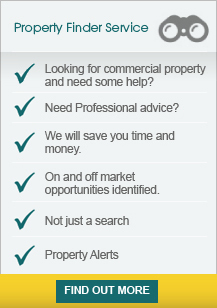 If you can't find the commercial property in Wednesbury you are looking for let us know and we will be able to assist you, or why not try out our property finder service and register for commercial property alerts. Our commercial property in Wednesbury are updated daily, so you can be rest assured we bring you the most recent and up to date commercial property listings. We also provide other commercial property services including property valuations, renegotiating leases, rating, and commercial property management in Wednesbury and West Midlands. The property is located prominently situated on Upper High Street, Wednesbury fronting the A461 High Bullen close to its intersection of High Street and Trouse Lane. Junction 9 of the M6 motorway is approximately 3 miles distant and Walsall Town Centre is approximately.. The premises are located on Bilport Lane off Holloway Bank less than a mile from the A41 Black Country New Road and roughly 2.5 miles from the Black Country route. Junction 9 of the M6 motorway is approximately two miles distant. Wednesbury 280 is located in an established industrial location off Woden Road West, just off the Black Country New Road (A41) and is situated approximately 3.5 miles south east of Wolverhampton City Centre, 9 miles north west of Birmingham City Centre and 3 miles north..
GWS Industrial Estate is situated fronting the A4037 Leabrook Road, Wednesbury, approximately half a mile from the A41 Black Country New Road dual carriageway which links Junction 10 of the M6 motorway and Junction 1 on the M5 motorway. Junction 9 of the M6 is located approximately.. The site is located off Holloway Bank, Wednesbury (A4196), approximately ½ mile to the south of the town centre. The site enjoys good communications with both junction 9 M6 and junction 1 M5 Motorways being within a short road journey. The site is also well served.. The property is situated along the south west of Holyhead Road and on the corner of Monway Terrace in a mixed commercial and residential location approximately 1/4 of a mile from Wednesbury Town Centre. Junction 9 of the M6 Motorway is approximately 2 miles to the north..
Wednesbury Trading Estate is located between the main A41 Holyhead Road/Black Country New Road and the A462 Darlaston Road, Wednesbury. There are two entrances to the estate, the first being the main entrance off Patent Shaft Roundabout opposite the Britannia Park and the.. The land is located on Bilport Lane off Holloway Bank, less than a mile from the A41 Black Country New Road and roughly 2.5 miles from the Black Country route. Junction 9 of the M6 motorway is approximately 2 miles distance.